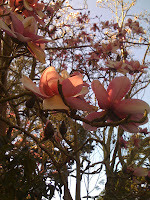 The magnolias were in bloom yesterday at the Botanical Garden in San Francisco. The sky was cornflower blue; the sun’s rays were warm and golden. Spring usually arrives the first week of February in this city, a fact for which I am grateful, especially if January has been cold and wet. 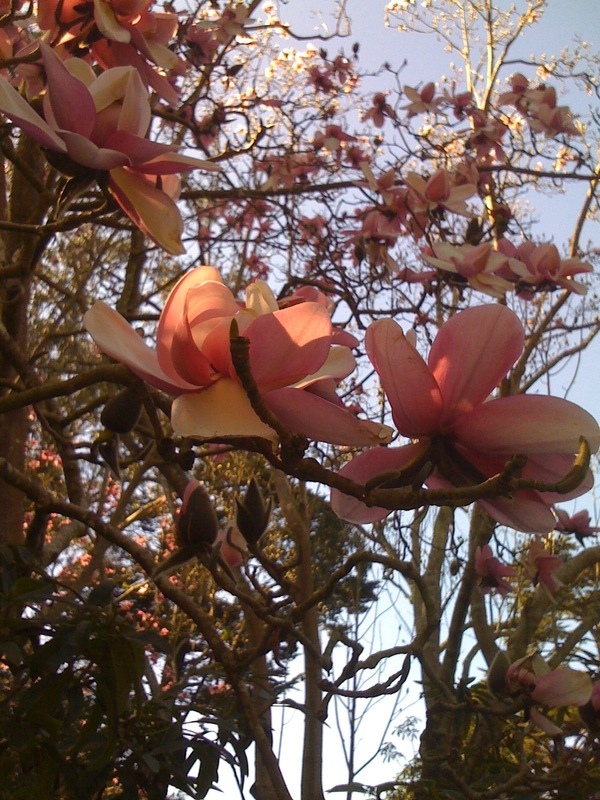 So I took a bike ride to Golden Gate Park where the unfurling pink and white velvet of magnolia petals were a delicious treat. As I strolled through the arboretum, in the midst of the Rhododendron Garden I ran across a circular seating area made out of stones that struck me as old. Very old. And the stones had personality. Soul, even. 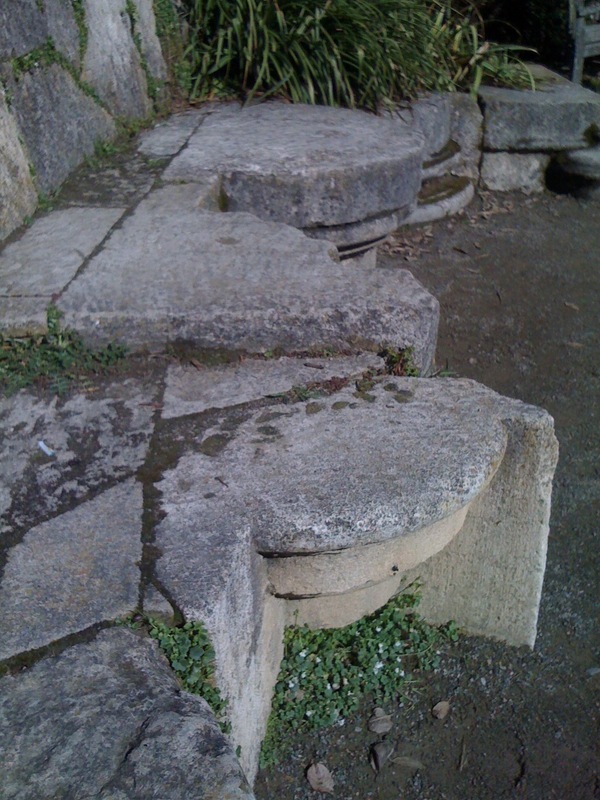 As I examined them, I noticed the stones were cut and carved in shapes that reminded me of, well, a medieval church of all things. Odd. 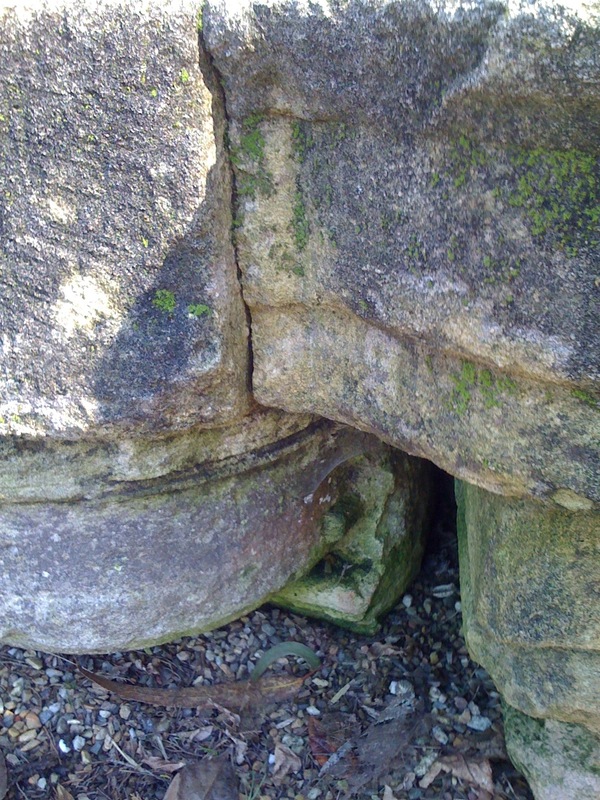 What were medieval-looking stones doing in the arboretum of a city not exactly known for medievally-inspired architecture? Time for some research! 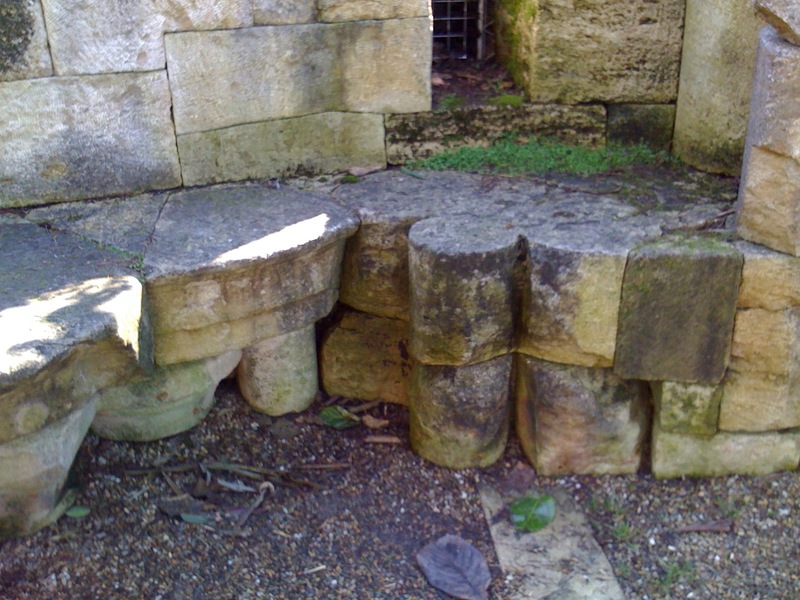 It turns out these stones are not medieval-looking, they are the real thing, remnants of a twelfth-century Cistercian Spanish monastery. I kid you not. 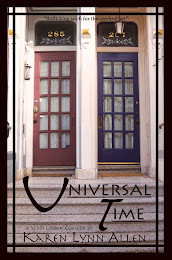 They are likely the oldest things you can touch in the city limits of San Francisco. 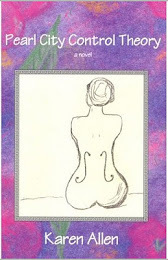 How they ended up halfway across the world surrounded by rhododendrons is your usual story of power, greed, bureaucratic incompetence, and Byzantine San Francisco politics, combined with a dab of grace and a sprinkle of serendipity. Construction began on the Cistercian monastery of Santa Maria de Ovila (in the Spanish province of Guadalajara) in 1188, probably to help hold the border area that King Alfonso VIII had recently reconquered from the Moors. A small monastic community thrived there over the centuries but eventually faded to the point that in 1835, by royal decree, the monastery was secularized and fell into private hands. Over time the site decayed, any portable parts of value were sold, and its buildings were used as barns and even a manure pit. Volunteer shrubbery grew from the vaulting. One can imagine goats traipsing through the abandoned interior. 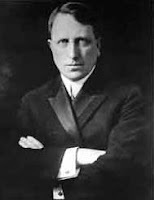 Our story now advances to another century and another continent where the brashest of characters arrives on the scene—William Randolph Hearst, media tycoon extraordinaire. 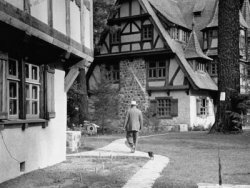 He has just had so much fun building Hearst Castle in San Simeon that he has another project in mind, a true blue medieval castle to replace his mother’s burnt down summerhouse near Mount Shasta. Medieval castles scarce in California? If you’re William Randolph Hearst, this is not a problem. Just get one from Spain! Good old Hearst, looting the treasures of Europe right and left like they were bonbons for the taking. 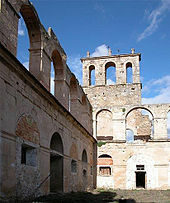 His agent in Spain recognized Hearst’s potential castle walls in the decrepit Santa Maria de Ovila monastery. He quickly arranged to buy the structure from the owner who, it fortuitously turned out, could use the extra $97,000 in cash. 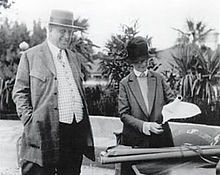 Julia Morgan, Hearst’s trusted architect who had designed his “castle” in San Simeon, drew up the plans for the proposed Wyntoon Castle based on the components Hearst had purchased. The monastery’s Chapter House would become the castle’s entrance hallway; the Refectory would be the “armory” that would display Hearst’s extensive collection of armor. The castle plan even included an eight-story tower with Hearst’s study, of course, occupying the top floor. The monastery’s church posed a problem due to its great size (150 feet long and 50 feet tall.) Try as they might, it seemed too large for an assembly hall or any other room appropriate to the castle. Solution? Put the swimming pool in it! Problem solved. The price tag for this medieval fantasy quickly rose to a cool $50 million. In comparison, Hearst’s yearly income ran about $15 million, so you can see this castle was an expensive dream indeed. 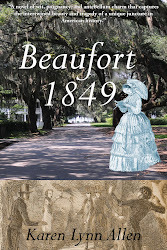 Whatever his shortcomings, Hearst never lacked ambition. 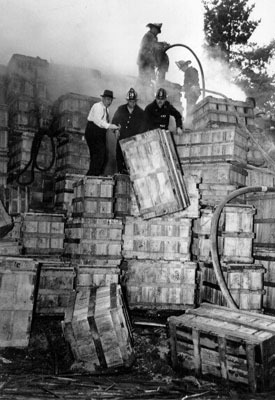 In 1931 a hundred laborers were hired to take much of the monastery apart and pack ten thousand of its stones in crates. 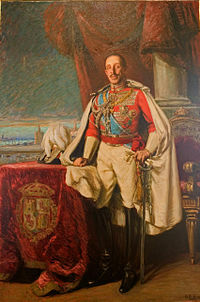 Although shipping even a single antique stone out of the country was illegal according to Spanish law, the King of Spain had just abdicated, the government under the Second Republic was in turmoil, and much could be gotten away with, especially considering the project was providing so many unemployed Spanish workers with jobs. (I suspect a bribe or two also greased the wheels.) The crated stones made their way via small trench railway to ferry to trucks to eleven German freighters waiting in the port of Valencia. From Valencia they sailed across the ocean, through the Panama Canal, to San Francisco where they were off-loaded at a warehouse near Fisherman’s Wharf. There the stones would wait while the site of Wyntoon Castle was prepared. But in 1933 the Depression caught up with Hearst. 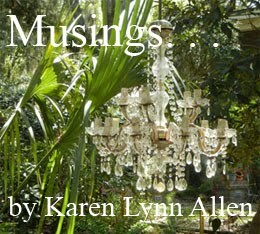 Money grew tight enough that work couldn’t begin on the new venture. The stones sat patiently in their warehouse accruing storage costs. Business went from bad to worse until eventually Hearst realized he would never be able to build his medieval dream. He built at Wyntoon a less expensive “Bavarian Village” instead. (Again, I kid you not.) He tried selling the monastery stones but there were no takers. Storage costs kept accumulating. 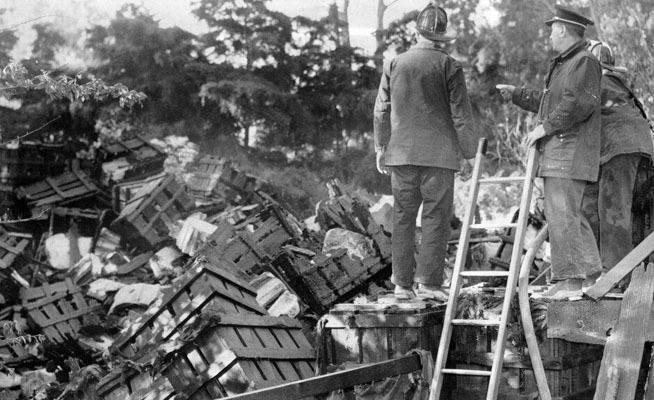 Franco suggested the stones be returned to Spain. Hearst did not oblige. Finally, in 1941, Hearst presented the stones to the city of San Francisco as a gift with the understanding that the monastery would be reconstructed and made into a Museum of Medieval Arts right next to the DeYoung museum in Golden Gate Park. The city was thrilled! Plans for the museum were drawn up. In return for Hearst’s generosity, San Francisco took care of the little problem of the $25,000 in outstanding storage debt. The stones were then carted to Golden Gate Park to await their transformation. But there were more bad years ahead for our stones. Money for the construction could not be raised. People disagreed where the museum should be built. The Board of Supervisors couldn’t gather consensus for a bond issue. A government Park commission couldn’t resolve the matter, and then a neutral citizen’s commission failed to make headway. As the years passed and the stones sat in the park unprotected from the weather and vandalism, they endured five (count them, five!) fires, at least two of them arson. 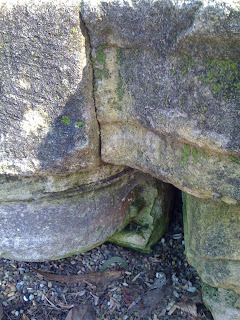 One wouldn’t think stones would burn, but the heating and then sudden cooling by water as the fires were put out took their toll, fracturing some of the stones internally. Brambles grew over the stones strewn in unorganized piles. Some smaller ones were carried off altogether to parts unknown. By 1960 it was determined that only half of the stones were sound enough to use in construction. In the decade of Haight Ashbury's ascendance, the Recreation and Park Department was given responsibility for our poor forsaken stones. Someone practical decided to put the stones to use, and a number found their way into various gardens in the park, including the Arboretum and the Japanese Tea Garden. 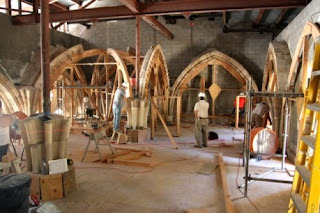 A few citizens still had the goal to at least rebuild the Chapter House of the monastery (a large room where meetings were held), but the price tag was now $3 million and funds never emerged. In the meantime, an order of Cistercian monks in Vina, California had a dream of reclaiming the stones for religious use—and for Cistercian religious use at that! They set their sights on rebuilding the Chapter House as a part of their own abbey. But they would have to be patient. It took thirty-nine years, from 1955 to 1994, before they finally convinced the Museum of Fine Arts in San Francisco to release the stones that remained of the Chapter House to them on permanent loan. There was public outcry in San Francisco at the decision (“The museum is giving away ‘our’ monastery!”), but the stones went to their new home nonetheless, and construction began at the Abbey of New Clairvaux. All these years later, the reconstruction is still underway (but almost finished!) if you’re ever passing Vina, California (population 237) and want to see what a twelfth-century Chapter House of a medieval monastery looks like. 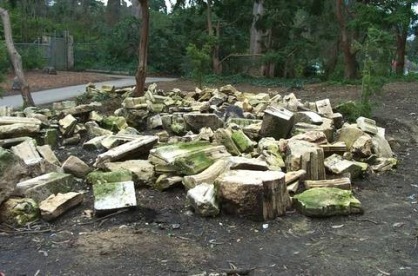 A portion of the rest of the stones can be found strewn throughout Golden Gate Park, especially in the Botanical Gardens. The Library Terrace Garden (near the Main gate) has a wall and seating area constructed from the stones, some of which were undoubtedly column capitals and other ornamentation. I also spotted some carved stones in the Fragrance Garden, and the Rhododendron Garden (most easily accessed from the North gate) boasts the architectural whimsy that first caught my notice. When the twelfth-century stonemasons put that monastery together, maybe they imagined their handiwork enduring centuries of weather as it sheltered monks and novitiates during the daily rituals of monastic life. Maybe the masons could even envision their stones facing fire and defilement. (Through war? Conquest?) But could they have dreamed that one of the richest and most powerful men in the world would take their stones to the other side of the planet for his personal pleasure? (Probably not given they didn’t know the world was a sphere and had another side.) And could they have imagined a city filled with skyscrapers that would want their stones to make a monument dedicated to the craftsmanship and art of their era? Or that this grand city would fail in their quest and decorate their gardens with the stones instead? Or that, eight centuries after the stones were first cut, monks separated so far in time and space from their medieval brethren would patiently gather some of the stones and use them to again shelter monks and novitiates in the daily rhythms of monastic life? The world spins and comes around, all in its own time. In the winter-spring sunshine, I sit on these stones carved so long ago, admire their soul, their beauty, and consider their grand journey through space and time.